The best way to understand ISO is with a little background . . . Remember these? 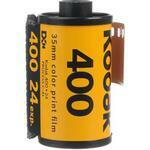 Kodak “400 speed” film. That number rating system used for film was called ISO. It stands for International Organization for Standardization, and it is the international standard for measuring the speed at which film developed using available light. The camera-makers needed a scale or measurement for the adjustments made to light sensitivity of digital sensor. So they used the system that was already available to them: the ISO system that had been used for film for years. So now, digital cameras can adjust the digital sensors, and the settings available to the photographer are labeled 100, 200, 400, or 800, just like the film speeds had been. This was a great development because now you can change your ISO whenever you want. Whereas previously you were stuck with the ISO of your film until you finished that roll, now you can change it every shot. It is a vast improvement. Since the early days of digital, camera manufacturers have got better at making these digital sensors light sensitive, and also at controlling the digital noise that develops. It wasn’t long before there were digital cameras with ISO ratings of 3200 or 6400. More recently, we are seeing ISO ratings of 12,800 or even 25,600. Some of the most recent digital cameras actually have ISO ratings into the six figures! While the ISO ratings have increased, the amount of digital noise has been dropping. As such, ISO now rightfully deserves its place as an equal partner with aperture and shutter speed in setting the exposure of your pictures. ISO 100 – This is the lowest native ISO in most cameras. Use this setting in broad daylight. If you are on a tripod, it is a good choice as well. You will have no problems with digital noise here. ISO 200 – Another photographer friend of mine convinced me to use this as my default setting (I used to always try to keep it at 100 to avoid any noise). Newer cameras are good enough that you really aren’t introducing any noise into your picture at this setting. Use this in daylight. ISO 400 – You might use this on a cloudy day. The noise here should not be too bad. Don’t hesitate to use this ISO if the light is getting dimmer. ISO 800 – This is a typical indoor setting with reasonable light. If you are outdoors, it may be time to break out the tripod though. In older or less expensive cameras, noise is becoming a real problem at this setting. With a new expensive camera, you are probably ok though. ISO 1600 – On an older camera, this is about as high as you are going to want to go. Use sparingly. If you are outside, you probably should not even consider this ISO if you have a tripod with me. ISO 3200 – Danger zone. Avoid this ISO setting, even on a new camera. Find a way to reduce the ISO if possible. The image will probably be noisy. ISO 6400 – Only photographers with newer cameras will even think about going here. Avoid it if at all possible. The picture will have a signficant amount of noise. Obviously, if you have a tripod or other means to reduce your ISO at this point, you should do so. You will probably need to give your noise-reduction software a workout if you shoot at this ISO. Although photographers routinely refer to ISO as the third leg of the “exposure triangle,” camera manufacturers have been slow to put that into practice. Most cameras have a dial for shutter speed and another for aperture, but commonly force you to press a button or go into the menu to change the ISO. It appears that this lesser treatment is just a hold-over from the film days when ISO could only be changed by changing the film. I offer that explanation just in case you find it is more difficult to change your ISO than you anticipated. One final note on this topic. Lightroom and other software has gotten much, much better at reducing digital noise in recent years. Using the noise reduction tools will still “soften” your pictures a little bit, but not nearly so much as in prior years, so judicious use of noise reduction tools in software can really help your pictures. If you use any kind of post-processing software, keep that in mind if you need that little extra boost. Hopefully you have read the other two articles on exposure (here and here), as well as the articles on shutter speed and aperture. Now that ISO has been covered in this article, you have been though all the elements of exposure. You should have a good grasp of it by this point. It is time to put this stuff into action. If you want to see some examples of me putting these exposure controls into action on my camera, check out our video where we walk through it. After that, check out the this article on 5 common exposure scenarios you are likely to face and see how I work through them.